My Dog Sighs has inspired countless art lovers with his now infamous Free Art Friday project, which began when the artist left his artwork in public spaces for people to find. After 15 years of giving his art away for free, My Dog Sighs has found himself strapped in to a well-deserved meteoric rise. With an incredible international following in the USA, Israel, Australia, Japan and the UK, three sold out shows under his belt, and astronomical numbers on Facebook, Instagram and Youtube; My Dog Sighs has become an important figure on the contemporary art scene. 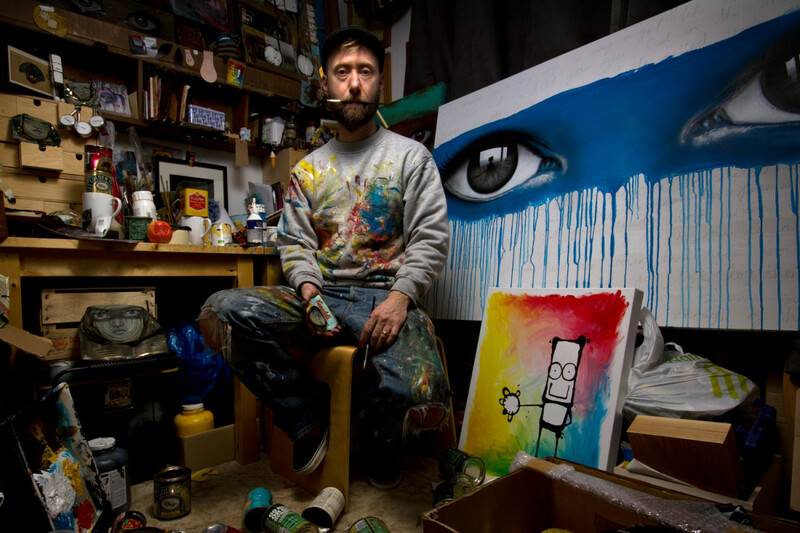 My Dog Sighs’ style is characterised by combination of melancholic and often naive portraiture with the use of found materials including used spray paint cans or abandoned food cans. His newest body of work features poignant narratives hidden deep within his signature glassy eyes.